Folks in the Boston area – what better way to spend this Sunday but in the arms of mother nature (and Allandale Farm)? 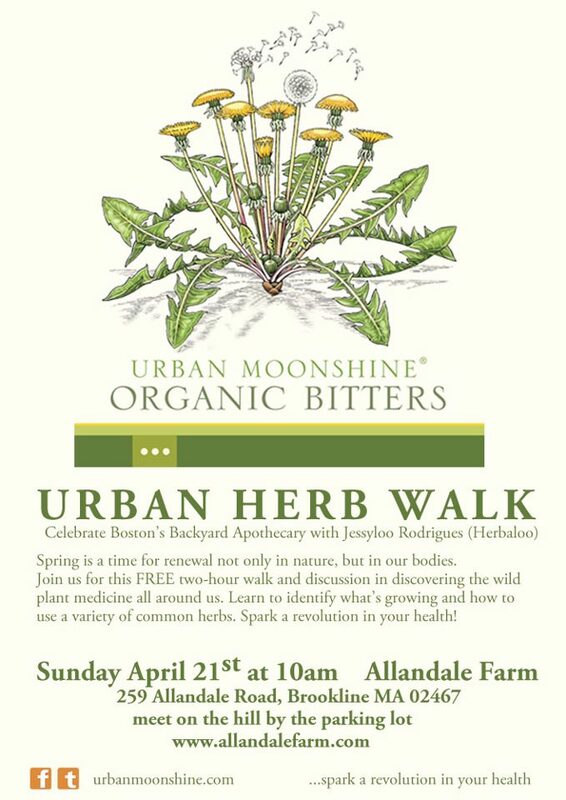 Please join Jessyloo Rodriguez (and myself, for just a wee bit) on a wild herb walk through the Allandale landscape, sponsored by Urban Moonshine. Time will be spent with elderberries, dandelions, motherwort, and some other pals. Hope to see you there! Dandelion image courtesy of donnieyance.com/. A great many thanks to Anna over at the wonderful (and Freshly Pressed!) Mom at Work for reblogging On Boston (In the Spring). Take a look at her lovely blog on running, being a mom, and working. She’s one of those powerhouses who does a million things and…blogs about it. Not always my forte. You all are great. Thanks, as ever, for reading and voicing your support. Hope you’re all well. Thanks for your check-ins, prayers, likes and virtual hugs. You might not know how much it means but it means an awful lot. The Boston Marathon is such an amazing event. The city is at its most beautiful – cherry blossoms are opening, the willows in the Fens are greening, and the whole quality of light is warming from the apathetic monochromatics thrown by winter. The architecture, in all of its brick and stone, its shades of clay, turns pastel. You smell grass and flowers, and the less lovely scents of the city, the exhaust especially, are diluted and dispersed by breezes. Because I always work on Marathon Monday, or Patriot’s Day – a holiday we were just joking about on Sunday, one that commemorates the rides of Paul Revere and William Dawes – I’ve only been to the marathon once. I was with my ex-boyfriend and was visiting from Maine. It was a gorgeous, gorgeous day. People were walking around without shirts on. It smelled not only of blossoms but also of summer, of hot asphalt, sweat, and sunscreen. We were strolling around downtown and suddenly came upon a wall of people. Nick claimed not to have known that it was Marathon Monday, and I think he really didn’t, but there I was, in my first spring away from home, on Boylston Street, brightened by the red and yellow and green and blue and orange flags of the dozens of countries participating, watching flashes of runners breaking toward the finish line. Flashes, and also people still running but running in that way that’s slower than walking, and everyone was cheering. Some called certain names, but most were just clapping and calling words and whoops of encouragement and appreciation. It was amazing to witness these weary people, some of them smiling, many of them stoic, lots of them wincing, making their way down to the finish. I was so overwhelmed by this assemblage of emotion and humanity, and I cried, and I called out, and I wanted to stay there for hours, until the last person crossed the line, just to keep witnessing all of these peoples’ love and determination and admiration. All of the glory. During the marathon Boston’s aesthetics are at its finest, but so are its people. It’s beautiful to consider your city being filled with people from such a slew of different countries, gathering in your downtown and running and wheelchairing through a place you love. It’s a 26.2 mile celebration of athletics and camaraderie and spring. It’s beautiful. And that beauty carried on through the smoke and the fire and cannonball sounds and the screaming. While my heart is broken, its doors are also opened by every story of strangers helping strangers, of the health care workers and the family members and the runners who helped each other and were helped by others. 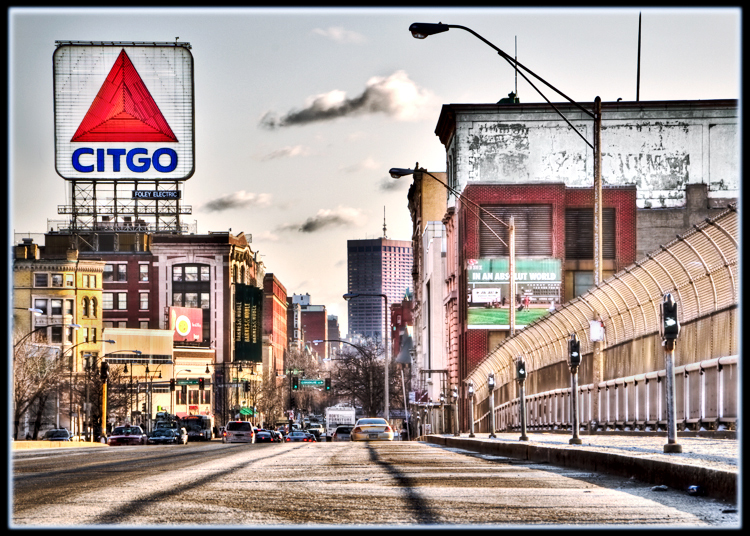 Boston is a great city. It’s a place that I love, a home that I’ve readily adopted, one that I’ve studied and explored in sentences and strolls. It’s surreal to wake up in it this morning, and horrifying, and ineffably sad. But it’s beautiful, too.